Ah nostalgia. 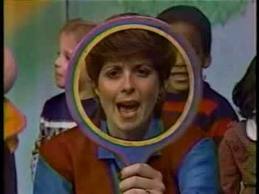 If you grew up in the late 70’s and the 80’s, you probably remember Miss Molly and the show that was Romper Room. At the end of every episode, you waited with baited breath as Miss Molly would grab the magic mirror and peer through your television. Would today be the day she see you? Recently, I was researching a company called Zmags, which creates beautiful rich media catalogs for retailers and others. 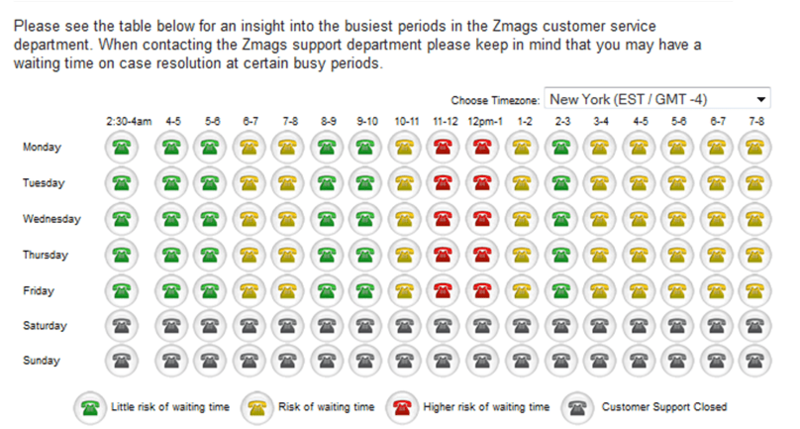 On their support page, there is a simple and effective graphic showing customers when the slowest and busiest periods for support based on time zone. It’s open and honest approach to helping customers determine when the best time to call for non-urgent issues. Ah transparency. Having a graphic, like the one above, puts out a shingle and sets a level of expectation for customers. It shouldn’t be used as an excuse for poor execution, and can be used for setting internal bars to overcome. This simple graphic started the hamster in my tiny brain running, and what else can be accomplished if other customer service metrics were made available and accessible to the public or your customer base. One of my greatest pet peeves of most companies today is the action of asking me for survey feedback and not providing any response in return. Imagine if you could go to a link on a company’s website, and see near real time Incident, Customer Satisfaction and Net Promoter Scores. Was your feedback inline with other customers? Was your experience an outlier? Was your verbatim feedback part of a larger trend? I believe this level of transparency would improve the customer experience. It shows your customers that your organization is open to feedback, taking action on your feedback, and is concerned about your feedback beyond just numerical scores. It also can be a place for proactive messaging. If your company has received feedback that a certain product or service has a defect, you could insert messaging to your customers as to how you are tackling this particular problem. And probably the most impactful result of opening up the customer service score kimono, executives and leaders would know that their scores are out there for the world to see. If your NPS or C-Sat score was below benchmark level, you can bet your last budget dollar that C-level leaders would be eager to invest more to bring those scores up. I’ve said it before and I will say it again, service level metrics should not be the primary metric used to determine the quality of your service. Unless your speed of answer is beyond acceptable (you know what acceptable is), how fast someone answers a phone, email, tweet or chat is a very small part of a customer experience. However, it is an important metric that shows both a part of the customer experience and how effectively staffed your organization is to help customers. Similar to the chart provided by Zmags, giving your customers an understanding of how often you answer their calls within an expected period, provides insight to how you often you keep your word (Walk matches Talk). The same thought process can be applied to FCR (First Contact Resolution) and any Compliance scores that are important to your customers. Again, by publicly providing how well you are serving your customers, you create even more accountability. You say your company is a great place to work, well prove it. Every customer loves to work and deal with a happy, pleasant associate. Everyone also knows when an employee doesn’t care about their job or their customers. By posting your employee morale, satisfaction and engagement scores, customers gain insight to how well companies treat their employees. Similar to companies doing social good, customers would rather transact with companies which take care of their associates. I wouldn’t recommend conducting an associate survey more than once a quarter, and make sure you are surveying in combination with broader company surveys. By pulling back the curtain to your metrics and satisfaction scores, you can create higher levels of trust between your organization and your current and future customer base. Yes, this level of openness has some potential risks. Customers may not understand the scores, what is excellent versus poor. But if you provide excellent service, why not show it off. The more you can open up your company to the public, the more they can build trust. (more on measuring trust) Innovation comes in many forms, you can make transparency your next. Do you think you are open enough to show off your scores? What would stop you from doing it? If your scores were available to the public, how would you change your actions? Do you remember Romper Stompers? They rocked!